When it comes to appetitive suppression, fiber gummies are really effective. They contain different kinds of slow digesting fibers that interact with water and create a volume that fills your digestive tract. This makes you much less hungry than before and helps you eat smaller meals. When it comes to weight loss, fiber gummies are an effective aid to your diet. Since this supplement helps you cut your calorie intake and battle cravings, so you can focus on exercising and making your diet plan in more effective. Which Fiber Gummies Are the Best? How do Fiber Gummies Work? Are Fiber Gummies Good for Ibs? Are Fiber Gummies Worth It? Are Fiber Supplements as Good as Food? Are Fiber Supplements the Same as Laxatives? Do you love indulging in delicious treats but also wish to lose some body weight? 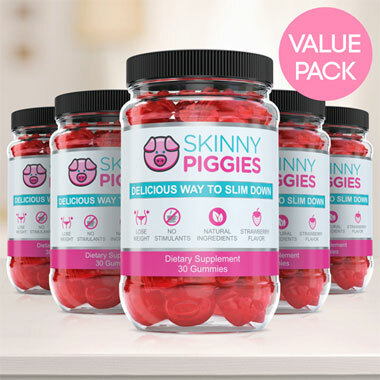 Now, there's a new dieting product that allows you to have a snack guilt free: Skinny Piggies! These delicious weight loss gummies are created to fight carb cravings and can make you feel satisfied, all while promoting weight loss. The key to weight loss is simple: Take in less calories than you burn daily and you will start losing weight, absolutely without fail! However when you start cutting back calories, and appetite and hunger become hard to deal with. That's where Skinny Piggy Gummies can help! These delicious hunger suppressant supplements are developed to not only help you fulfill those cravings, but also help you to stick with your dietary regime by helping you suppress your hunger. 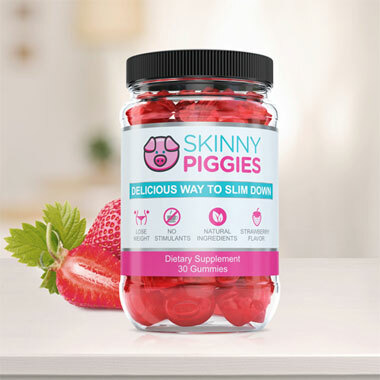 How Do Skinny Piggies Fiber Gummies Work? Hunger is driven by 2 things: energy consumption and the feeling of food in the stomach. After you eat a meal, your stomach fills up and your stomach stretches. That makes you feel satisfied and you don't feel hungry and will stop eating. Ok, so what do you do? Have a dessert first! Chew and swallow one Skinny Piggy about twenty minutes ahead of your lunch with a full glass of water. When the Skinny Piggy gets to your stomach it soaks up the water and expands into a mushy gel. This gel occupies space in your stomach and alerts your nervous system that you just ingested a good portion of food -all before you have eaten real food. 30 minutes later and you may start eating your meal! Now, the gel is in your stomach and you feel to some extent full which means you'll be able to eat a smaller sized meal and still being full and satisfied. 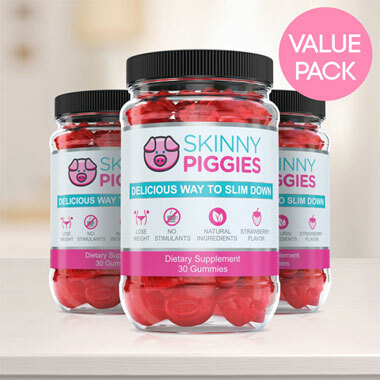 Take a Skinny Piggy gummy and you'll eat less calories, reduce sugar cravings and let your body to be in fat-loss mode . This way you can stop appetite and food cravings, hunger, and keep your caloric intake down, all without feeling like you're eating less than before. When you take Skinny Piggies fiber gummies prior to eating, it form a gel-like coating all around the food. That slows the transport of the glucose into your blood. That helps keep the blood glucose level a bit more steady and makes sure your body remains in fat burning mode all day. It can even help make your workouts much easier. How do Skinny Piggies Compare to other Fat-Loss Gummies? Skinny Piggies contain no artificial additives: you can read and pronounce each of the active ingredients. The nutrient rich, all natural ingredients in Skinny Piggies also have multiple benefits that include support for healthy looking skin, anti-aging properties, and healthy looking hair and nails. Also, Skinny Piggies contain absolutely zero stimulants. That is a crucial fact to know because if you eat stimulants, not only you will be suffering from exhaustion and fatigue down the road, but it limits you from using them in the evening. Take a stimulant based fat burner in the evening and you will not sleep. With Skinny Piggies, you can eat them even before going to bed. And lastly, what other diet pill is as delicious as a mouthwatering fruit gummy? 'Thought so! Losing weight is difficult, but Skinny Piggies are ready to help you make it more easy on you. You will love the taste of our fiber gummies, so forgetting to take your health supplement every day won't be an issue. Skinny Piggies are dietary supplements that is fun to take.